This sage is an outstanding hybrid plant discovered by Fred Boutin at the Huntington Botanical Garden. It was distributed back east by Holly Shimizu, now at the Lewis Ginter Botanic Garden, and has been the most popular new Salvia for the last fifteen years. It is a rapid grower, and blooms most of the summer season, attracting flocks of bumblbees and butterflies. The multitudes of long blue and indigo spikes are useful as fresh and dried flowers. Give this plant a lot of room to grow, even in the colder parts of the United States, where it is best treated as an annual. This plant forms colonies in loose soil that are loaded with multitudes of short spikes of blue flowers. It is like a miniature S. uliginosa, and is related to it and other members of section Uliginosae, including S. urticifolia, S. arizonica, and S. sinaloensis. It makes a good container plant, and has a long blooming season. It adapts to humid conditions well, and sets enough seed to self-sow modestly. This hybrid arose in the botanic garden at the University of California at Berkeley. It has an intermediate habit and is as vigorous as S. karwinskii, the larger parent. Under ideal growing conditions, it can get ten feet tall in one year, and it puts out a serious display of tubular rose to maroon flowers that draw hummingbirds. It tolerates humidity quite well. Though a bit late to bloom, it can put on quite a show during late summer in colder areas. Thus, it is worth growing as an annual. So is the new hybrid S. leucantha aff. `Waverly'. Also, the hybrid `Anthony Parker' and the new form `Santa Barbara' should definitely stir interest. An old favorite, this sage from southern Brazil thrives in moist areas and rich garden soil, where it can become a thug. Although tall and erect, it develops a multitude of rhizomes. It is more tolerant of cold than many other tropical sages. 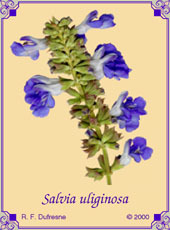 It has some cousins in section Uliginosae, including Salvia glechomaefolia, S . urticifolia, S. arizonica, and S. sinaloensis that are worth growing. Planted in an area where it can be controlled, it is a reliable showy summer bloomer that can produce a modest amount of seed. The foliage has a green, somewhat petrochemical scent. This robust, hairy, green sage from southern Mexico generates some of the richest blue flowers that I have seen on tropical sages. A fast grower (from seed as well as cuttings), it can get six or more feet tall. Bloom is late in the season, and usually reliable. This is a sage that withstands humidity well; it needs to be tried in the warmer parts of the Southeastern states. The foliage can develop a scent reminiscent of old-fashioned gelatin capsules. Its cousin, S. amarissima, is a known medicinal plant.